A pair of playful Clownfish, nestled comfortably in their anemone - Puerto Galera. Located the along the Western edge of the Pacific Rim, 500 miles to the West of Guam and Micronesia, lies the island nation of the Philippines. Technically considered an archipelago, the country consists of a staggering 7,107 individual islands. Combined, the islands provide more coastline then the entire United States. The Philippines form the Northern end of the Coral Triangle, with Indonesia to the West and Papua New Guinea to the East. The Coral Triangle is generally regarded as the region containing the world’s highest level of marine biodiversity, making it the ultimate destination for scuba divers and underwater photographers. Home to approximately 100 million inhabitants, the Philippines offers a cultural heritage that consists of a mixture between Malay, Chinese, Spanish, American and of course “Pinoy” (i.e., local) traditions. In addition, it is the only predominantly Christian country in Asia. I spent the first 20 years of my life in the Philippines. My family even had a beach house just North of Anilao, near what is now one of the most popular areas in the country for diving. Surprisingly though, I learned how to dive in the frigid waters of British Columbia, Canada, after leaving the Philippines in the early 1990’s. It wasn’t until several years later that I finally saw the wonders that lay beneath the crystal waters of my homeland. Since discovering the marvels of diving in the Philippines, I’ve returned regularly over the past 12 years in search of the best sites to capture these underwater sensations on film (and more recently on CF Cards!) Regrettably, there continues to be shortsighted destruction of reefs in some isolated areas, carried out by local fishermen who ostensibly do not know any better and still practice dynamite and cyanide fishing methods. There is, however, an admirable conservation effort going on throughout the country. 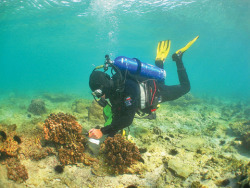 Many marine parks (formal and informal) are being formed by the federal and local governments and the country has begun to realize that the dive industry is more lucrative than the fishing industry since happy divers will tip more at the end of a week long trip than most fishermen make in a month. Diving in the Philippines is usually done on local outrigger canoes called “bangkas.” The smaller ones take between four and six divers while the larger boats have capacity of up to a dozen passengers including dive gear. A simple backward roll takes you into the warm, clear tropical waters and you’re on your way to an adventure you’ll never forget. The country is divided into 3 distinct island groups, Luzon, the Visayas and Mindanao. I’ve been fortunate enough to have the pleasure of extensively diving in the first two. Although diving can be found throughout Luzon and its surrounding islands, the predominant diving areas are in the Provinces of Batangas and Oriental Mindoro, more popularly known as Anilao and Puerto Galera. Anilao and Puerto Galera are a photographer’s heaven since despite the much talked about El Nino and La Nina cycles that have devastated many of the world’s reefs, both the hard and soft coral cover in Luzon are amazingly well preserved. Conveniently, Anilao is a quick two hour car ride from the city of Manila, and is billed as the “Nudibranch capitol of the world”. For those of you with puzzled looks on your faces: nudibranchs are aquatic, snail-like critters that come in a dazzling, near infinite array of colors and shapes. To many divers, they are simply the most fascinating creatures to look for. The hundreds of species found in the country (approximately 700 at last count) make it a photographers dream since there are plenty of opportunities to get just the right shot. Blue ribbon, moray and snowflake eels, lionfish, various species of parrot, damsel and trigger fishes are all common sights in Anilao. Of course, no South Pacific dive trip would be complete without the perennial favorite, amphiprion ocellaris, also known as the clown or anemone fish made popular by Disney/Pixar’s film, Finding Nemo. Additionally, large schools of travelly have started to appear in the waters of Anilao, typically found at a dive site called Twin Rocks. Dive sites of note in Anilao include: Beatrice, Sombrero, Mato, Twin Rocks and Bahura. A guarded Ribbon Eel displays its colors - Anilao. Across the channel from Anilao, an hour boat ride from the main port of Batangas, is Puerto Galera (Port of Galleons). The sheltered natural harbor is a former stopping point for Spanish Galleons headed back to Spain from the Americas. Each of the three small bays that composes Puerto Galera, Sabang, Small La Laguna & Big La Laguna, has it’s own distinct flavor. For those seeking a slightly seedier experience with loud music and plenty of adult company, Sabang would be the place. A five minute walk down the beach will land you in the more laid back, family and diver friendly, Small La Laguna. A short climb over the bluff from Small La Laguna is Big La Laguna, with it’s white sand beach and abundance of snorkeling shops. The Whale Shark is the largest fish in the world - Leyte. The underwater flora and fauna of Puerto Galera is similar to that of Anilao, but where Anilao has large expanses of shallow reefs, Puerto Galera has more walls. One area is not necessarily better than the other; it’s entirely a matter of personal preference. Must see dive sites off of Puerto Galera include: Sabang Wreck (On my first trip there, I did five of my 31 dives in Puerto Galera at this one site! ), the Canyons, Sinandigan Wall, The Drydock and Verde Island Pinnacle. A final area on Luzon that should be noted for its adventure factor is the town of Donsol in Sorsogon Province. A thriving snorkel and dive industry has cropped up there due to frequent sightings of whale sharks, or “butanding”, as the locals call them. Whale sharks are commonly mistaken as being whales, but in actuality are the largest fish in the world. The big animals congregate around Donsol every year between November and June, with the most sightings happening between February and May due to large plankton blooms at the mouth of the nearby river. Visibility can be poor due to the large amount of plankton in the water at this time of year, but visitors will generally still see several whale sharks (sometimes up to 15 or more!) throughout the day during peak months. Interaction with the whale sharks is regulated by the Department of Tourism in an effort to protect these gentle giants. Diving with them is not allowed in the bay around Donsol although dive trips where whale sharks are often spotted can be arranged through several dive shops in town. South of Luzon are the Visayan Islands. The jumping off point to the Visayas is the island of Cebu. Cebu City is the second largest in the country after Manila, as well as the region’s capitol. Cebu is serviced by Mactan International Airport. There are direct flights to Cebu from many of Asia’s gateway cities for visitors who prefer to bypass Manila altogether. The island of Cebu offers numerous dive destinations, and one area now gaining popularity is the nearby island of Malapascua, separated from Cebu itself by a small strait. Three hours north of the airport, this little island has become famous for regular sightings of deep water thresher sharks. Though in order to see them, divers need to be in the water before 6:30am. Monad Shoal, as the site is called, is the top of an underwater plateau. Rising from a thousand feet below, the top is usually at a depth of 70 feet. Divers are led by dive guides to the edge of the plateau where the sharks slowly start swimming by. With visibility in the 40 – 50 foot range, some divers find it unnerving when a 12 foot shark materializes out of the murky waters. Sightings are fairly regular, year round. As the rainy season approaches, large pacific mantas start visiting the shoal as well. Note to photographers: I recently found out that all of the resorts have implemented a “no strobe, no light” policy when doing the thresher shark dives. Given the depth and resulting low light levels, capturing great images may be difficult. The alien-like Mantis Shrimp - Anilao. West of the main island in Cebu is the small island of Pescador. For the past three years, a massive school of silversides has made the area its home. The school has been measured at over 400 feet long, 100 feet wide and 30-40 feet deep. Your daytime dive will quickly turn dark if you happen to be below the school as it can actually blot out the sun. Thresher sharks have been seen flitting in and out of this massive school, using their whip like tails to stun the small fish, then wheeling around to feed on them at their leisure. Southeast of Cebu is the quizzical island of Bohol, as well as the gorgeous island of Balicasag. The latter is a tiny little island that one can walk around in 45 minutes, Balicasag has amazing drop offs just a few yards from shore. Large coral fans and schools of jacks are ready to greet you as you plunge into the water. A fish sanctuary was established here by the Philippine Department of Tourism and there is also a lovely resort on the West side of the island. Duplex huts of native construction lie within a few yards of the water and are only 20 yards from the drop off, making a remarkable shore dive very easy and convenient. The usual inventory of South Pacific reef critters await as divers submerge themselves next to splendid walls. Lionfish are found in nearly every nook and cranny hunting for food, a plethora of butterfly and cardinal fish hug the walls as you descend, and with good reason as sometimes a solitary reef shark can be seen swimming by. This site is a wide angle heaven for any photo enthusiast. For a break from diving, Bohol is the home of the famous Philippine tarsier, a tiny critter with eyes almost the same size as its head. A good topside diversion is to visit the Tarsier Center and Chocolate Hills Park. The Chocolate Hills are a naturally occurring set of hills that often remind observers of a gigantic bowl of Hershey’s Kisses. Alona Beach is a great place to base yourself on the island of Bohol, a perfect location offering access to a nice mix of land-based activities and diving. The Ghost Pipefish is a fascinating relative of the sea horse - Negros. Southwest of Balicasag is the Island of Negros. Easily reached by a fast ferry service from either Bohol or Cebu. Most resorts offer a pick up service from the municipal pier on Negros. The southern most tip of Negros is composed of dark volcanic sand and some of the most astounding creatures can be found there. Of particular interest is the clown frogfish, a rare and highly desirable subject for photographers. While Negros and the town of Dauin are rapidly overtaking Anilao as the critter capitol of the Philippines, the most drastic difference between Negros and Anilao for photographers is that shots in Negros will be significantly darker due to the volcanic sand as opposed to the white sand bottoms of Anilao. Off the southeastern tip of Negros is tiny Apo Island, the home of the Apo Island Marine Reserve, a marine sanctuary established in 1982 that is a popular destination for divers from around the world. All the area resorts offer day trips to Apo Island, usually doing 2 dives and offering a packed lunch prior to returning. The reserve only allows a limited number divers per day and the pristine condition of the reefs show it. Beautiful fronds of soft coral, large numbers of fish and the most stunning site of all, an anemone fish city where in just 30 feet of water, hundreds of thousands of clown fish rise up to greet divers. Further to the West is the island group of Palawan, and its capitol city, Puerto Princessa. Philippine Airlines has daily flights from Manila to Puerto Princessa which is the embarkation point for liveaboard dive boats going to the Tubbataha National Marine Park (a United Nations World Heritage Site). A stopover in Puerto Princessa before or after a liveaboard trip is highly recommended. Great local handicrafts, fresh grilled seafood and ice cold San Miguel beer at Kina Butch (Butch’s Place) offer a perfect start or end to a great trip. Open only during the months of March to June, the reef system of Tubbataha National Marine Park absolutely teems with marine life and remarkable coral walls. Large pelagic creatures such as sharks, rays and mantas can be seen here. It is truly a place worth visiting and is considered by most to be the best diving in the Philippines. Tubbataha has three main areas, Jessie Beasley Reef, North Tubbataha Atoll and South Tubbataha Atoll. The park itself is protected by a core of Park Rangers who stay year round (typhoons and all) on one of the small fringe islands of South Tubbataha. Most liveaboard trips are five to six days long and offer four to six dives per day. A Voluted Clam with sun-rays overhead - Leyte. The last place on my rapidly expanding list of dive sites is Leyte. Until just a few years ago, Leyte was known for two things. The place where Gen. Douglas MacArthur fulfilled his promise to the Filipinos and returned to take the country back from Japan during WWII, and for being the birthplace of the world’s most famous shoe fanatic, Imelda Marcos. Happily, Leyte – and specifically the town of Padre Burgos in Southern Leyte – has a new claim to fame: consistent sightings of whale sharks; and of vital importance to photographers- sightings in clear water. Conveniently, Philippine Airlines offers three daily flights to the Provincial Capital of Tacloban. From there, the dive resorts will arrange for air conditioned transfers for the three to four hour ride south to Padre Burgos. Similar to Donsol but slightly shorter, the whale shark season in Padre Burgos’ runs from late November to March but is best timed around the full moon as this brings the whale sharks’ food source up to the surface. Per the Department of Tourism regulations, guided whale shark encounters are done with snorkel only. However, on my recent trip there I saw a very large whale shark while diving, which is not uncommon during peak season. Southern Leyte also boasts some of the most pristine reefs in the Philippines; Napantaw Fish Sanctuary and Limasawa Island have reefs that rival those found in Tubbataha, with huge fronds of soft coral and healthy hard coral formations. The pristine reef and clear waters of Tubbataha. These popular dive destinations only scratch the surface of what can be seen in the waters off of the 7,107 islands of the Philippines. The exciting thing for any diver or photographer headed to the Philippines is the number of opportunities to see and photograph so many exotic species of flora and fauna in one fairly small region of the world. Despite the plethora of images presented here in this article and in the photo gallery shot by Calvin Tang off of Anilao – these are but a sampling for those seeking to experience the innumerable treasures in the waters surrounding the beautiful island nation of the Philippines. Getting There: Philippine Airlines and Cathay Pacific Airways offer the most flights from the West coast of North America to the Philippines. Cathay Pacific requires a quick layover in Hong Kong, though they offer a choice of either Manila or Cebu as a final destination, which is convenient if you are short on time and want to head to the South islands. If you have more time or want to dive one of the many sites in Luzon, Philippine Airlines will fly you to Manila where you can then take advantage of their local routes to get around the country quickly and inexpensively. Philippine Airlines offers their Sportsplus Global package to any of their Mileage Club Members (the Mabuhay Miles Club). For U$120 per year, club members are allowed an extra 50lb bag for sports equipment – a bargain even for less frequent travelers since a single extra bag would regularly run $200 per leg. Those visiting the Philippines from destinations outside of North America should also check Thai Airways, a Star Alliance carrier that offers a great level of service and reliability. Climate: The Philippine Islands are tropical and have a wet and a dry season. Temperatures range from 80°F during the rainy season to near 100°F during the dry season. The humidity is typically high, year round. High SPF sunscreens are a must, and a hat with a brim also comes in handy. What to Bring: Lightweight clothing and gear are highly recommended, based on airline baggage weight limits. Leave the jeans at home and unless you’re planning on going to a formal dinner party – modest, casual attire will do for pretty much any occasion. Water Temperatures: Low to mid 80’s. When diving only occasionally a dive skin should prove to be fine, but for repetitive dives (3 or more a day) a 3-5mm suit is recommended for comfort. Regardless of how you deal with water temperature, a full-suit is recommended for protection from abrasion and from irritants you may come across in the water. Electricity: 220 volts, 60 cycles. Ensure that your electronics are set up to handle 110-220 volts, or else bring along a voltage transformer. Also, standard, two-blade US-style power plugs work in most places around the Philippines. Just to play it safe, bring adaptors for the round, two-plug outlets as well. More information on power outlet styles here. Entry requirements: American and Canadian citizens are automatically granted a monthlong visa, as long as a valid departure ticket is presented along with a passport that is valid for six months past your departure date. Citizens of other countries should check with the Filipino government for visa requirements. Money: Credit cards are generally accepted in the cities, but unless you’ve made prior arrangements with rurally located dive resorts and operators, cash and/or travelers checks are preferred to credit cards and is often the only form of payment accepted. When using a credit card overseas, ensure that your card issuer does not charge the typical 3% “currency conversion” fee. ATMs are also available in most cities, but it is highly recommended and easiest to exchange money at the airport after you clear customs. This entry was posted in SCUBA Diving, Underwater Photography, Water and tagged dive travel, southeast asia, underwater photography, warm water. Bookmark the permalink. Post a comment or leave a trackback: Trackback URL. Wow! Love the pictures of the nudibranch’s. Excellent article, now if I can only get the fiance to agree to a dive trip now. If she comes here expecting answers as to why I am adamant about traveling to the Philippines, I am sorry :). Thanks for the excellent article and pictures! Justin, Feel free to ask. My record for Nudi’s there was 35 unique species in 1 week! S.
Excellente, Stu! Wonderful images too! Will post a link on my blog. Cheers bud! Fantastic job Stewart!! Your article was filled with a lot of useful information and quality photos. I can’t wait to get back and explore more of this wonderful country. Great article and fantastic photos! Me and my friends shared this article in facebook so many times. We just concluded the 1st Philippine Dive Seafari in the Philippines. Were you part of it? Thanks for your kind words. No, I wasn’t able to go due to a previous engagement. I hope to attend next year. I’m a transplanted Pinoy =), been living in Canada for 22 years now. But I return to the Philippines as often as I can to dive. @ Jett and Dave. Thanks Buds! =) Here’s to more diving and roast pig! Welcome to world class diving in the Philippines! As part of South East Asia, the Philippines is blessed with the best diving in the world, with the advantage of biodiversity of Micronesia with both Macro and Pelagic life calling these waters as their home. Certain dive operations also operate with traditional dive boats and if neither of these options is appealing, there is always the Expedition Fleet Liveaboards to serve your diving needs.